Today we are very proud to offer the most advanced control systems in the industry with an improved high efficiency Infra-red heating system making Thermika die ovens the absolute state-of-the-art in aluminum extrusion. Our progressive R&D program has produced substantial improvements in existing infra- red heating as well as the ongoing development of cutting edge technology such as magnetic heating. 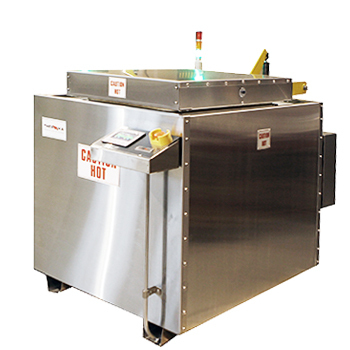 Thermika infra-red oven saves money, energy, and improves production efficiency. Improved recovery State of the art control system that literally puts everything at your fingertips. The user-friendly keypad is fast and easy to program and can store over 100 recipes that are simple to change and don’t require production stoppage. Our front loading oven is designed with a sliding door that makes loading and removing the die more convenient. This design reduces the chance of damaging the oven during the load and removal process. All Thermika ovens are constructed with high quality material to ensure a long life span. 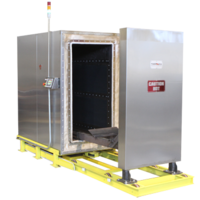 Our ovens are made to order, have no fabrication limitations, are very maintenance friendly, and include fast delivery. Our top loading oven design is our best-selling oven. Our latest model is engineered with improved features that makes it the most efficient and user friendly oven to date. All Thermika ovens are constructed with high quality material to ensure a long life span.